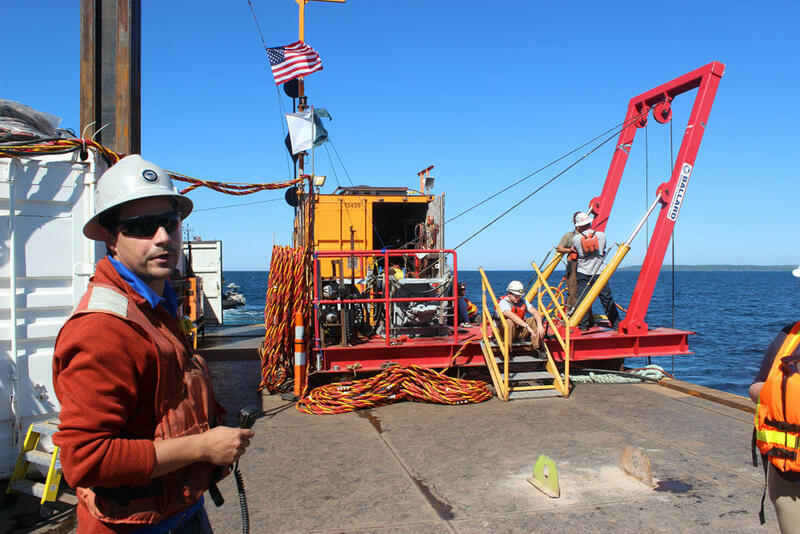 Chris Bauer, a project manager for Ballard Marine Construction, points out the crew that supports the diver. The barge in the middle of the Straits of Mackinac. A tug keeps the barge in place. Chris Bauer, project manager for Ballard Marine Construction, monitors their anchor work. 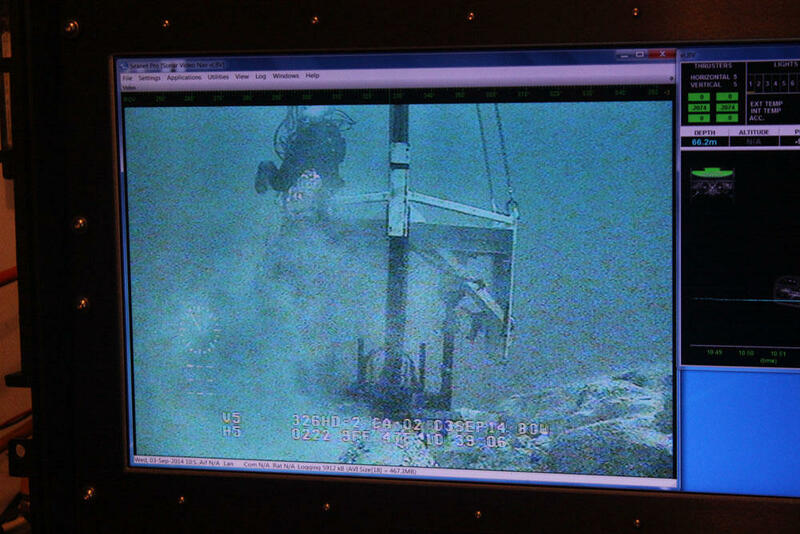 A diver finishes anchoring the support in place on the Line 5 pipeline. 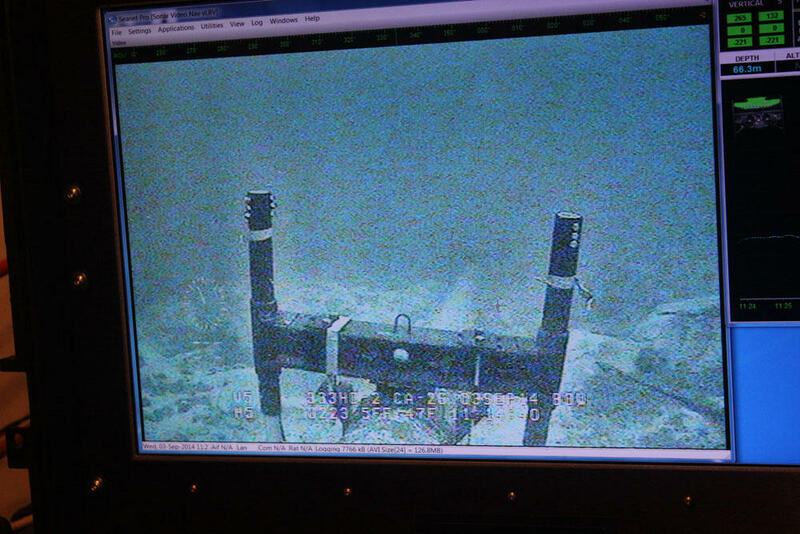 This anchor is more than 220 feet down. Screw anchors hold the support in place. Line 5 on the bottom of the Straits. A close-up view of the support just put in place. These types of supports have been installed over the last 12 years. 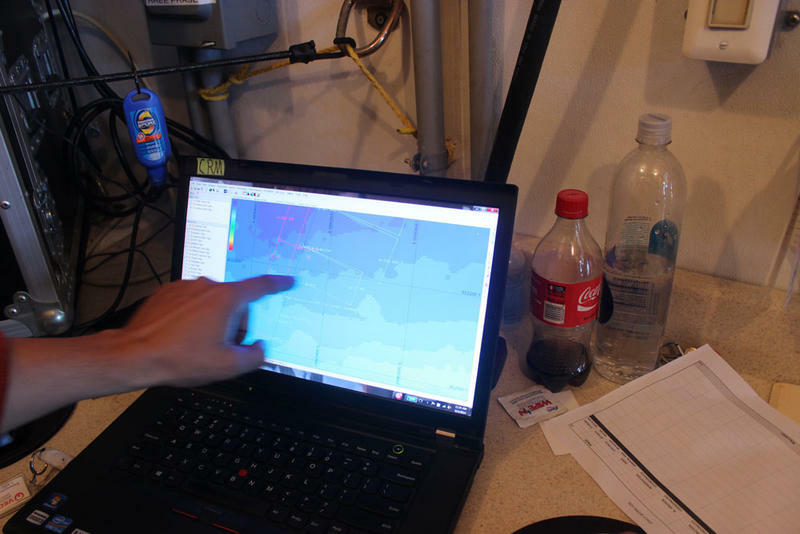 A map keeps track of the span distances of the pipeline. Jim Hebert, dive captain for this effort. He says it's one of the most dangerous jobs in the world. Tom Prew, region engineer for Enbridge, oversees maintenance on the line. 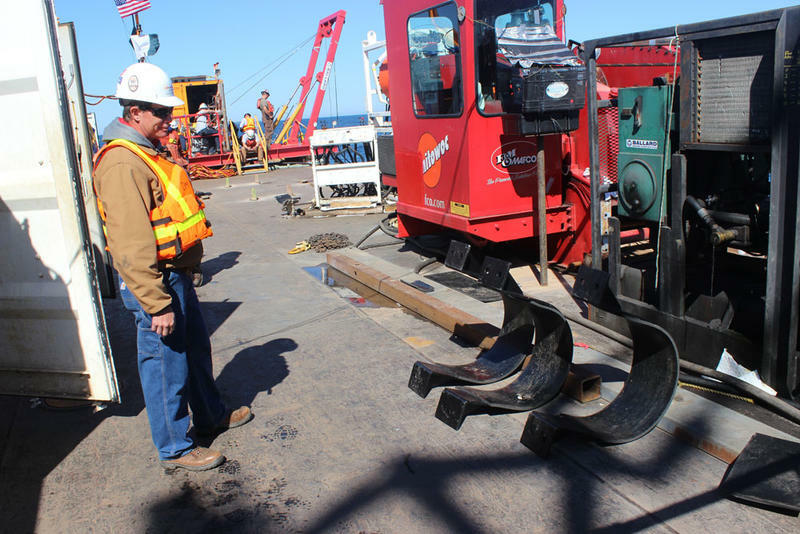 One of the anchors off the barge. Pipes used on the underwater supports. Brackets for the Line 5 oil pipeline. 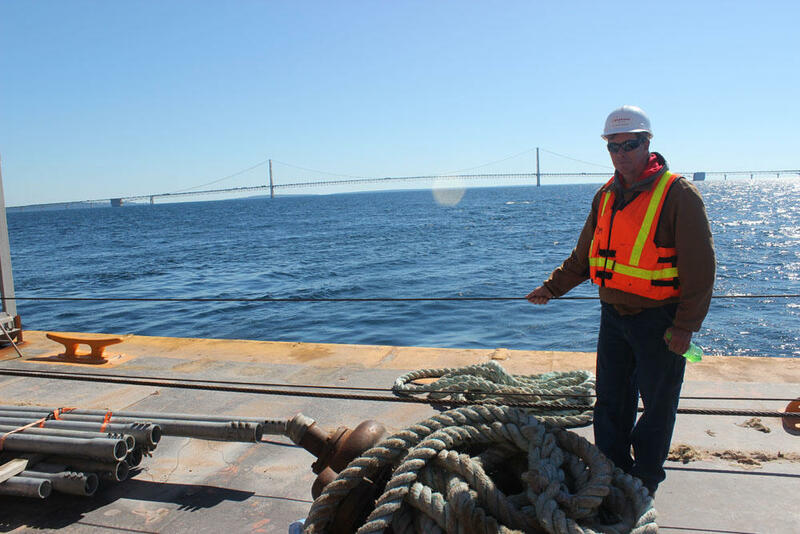 Prew on the deck of the work barge on the Straits of Mackinac. 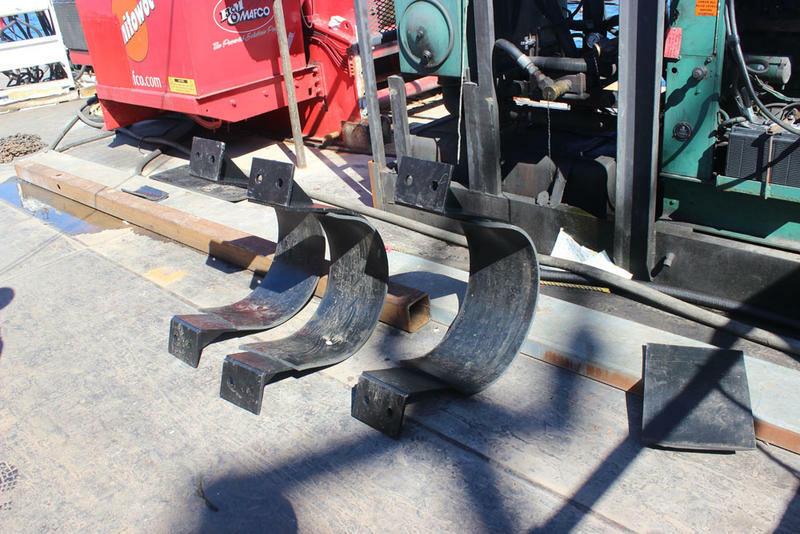 Brackets for the pipeline sit on the deck. Zebra mussles on a removed bracket. The crew bringing the diver back to the surface. 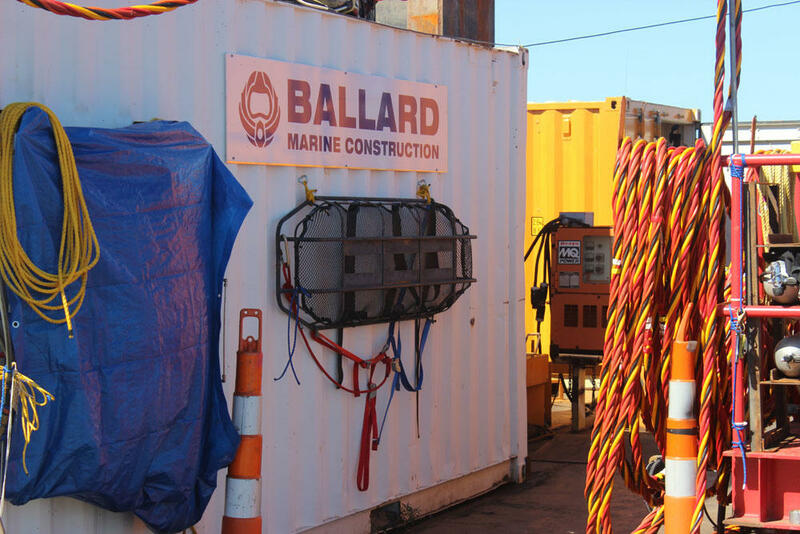 Ballard Marine Construction is the contractor for this work on Line 5. 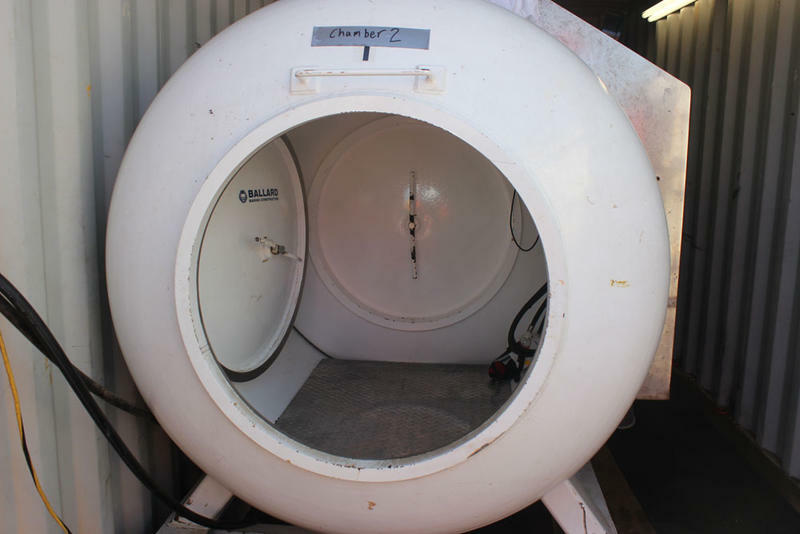 Once the diver reaches the surface after being more than 200 feet down, they will spend a few hours in this compression chamber. The people supporting the diver. 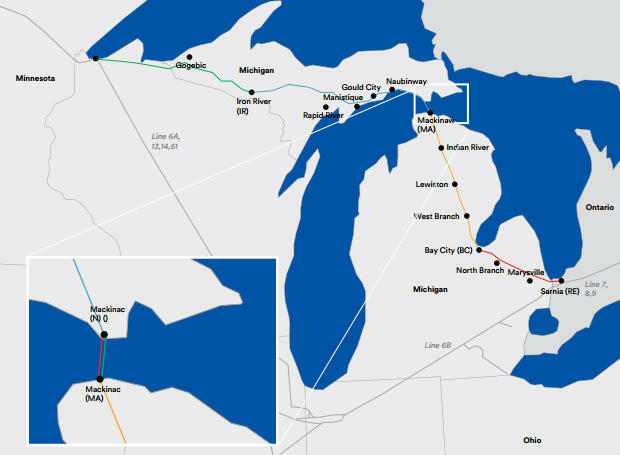 Enbridge Line 5 runs from Superior, WI to Sarnia Ontario, crossing through the Great Lakes at the Straits of Mackinac and the St. Clair River. 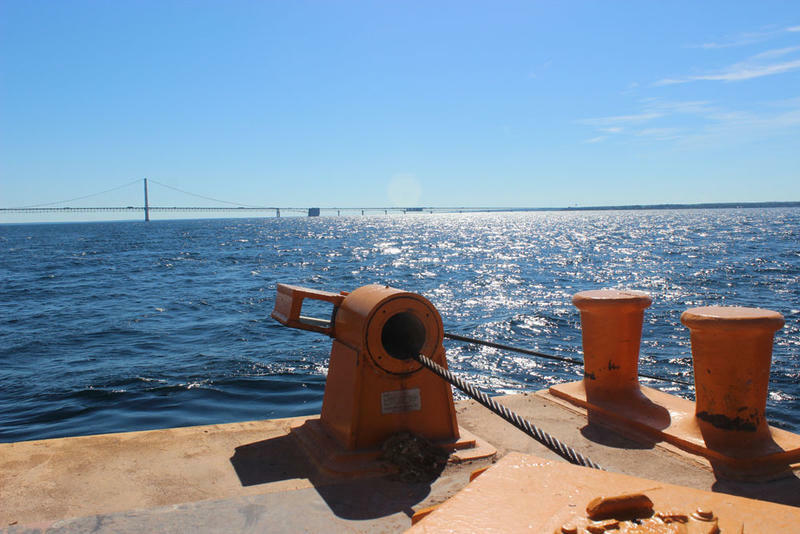 This section of Line 5 was built on the bottom of the Straits of Mackinac 61 years ago – right before construction started on the Mackinac Bridge. Michigan’s 1953 easement with Enbridge lays out all kinds of technical specifications, including operating pressures, specifications for the type of steel used to build the pipeline, automatic shut-off valves at either end, and specifications for maximum unsupported span lengths. 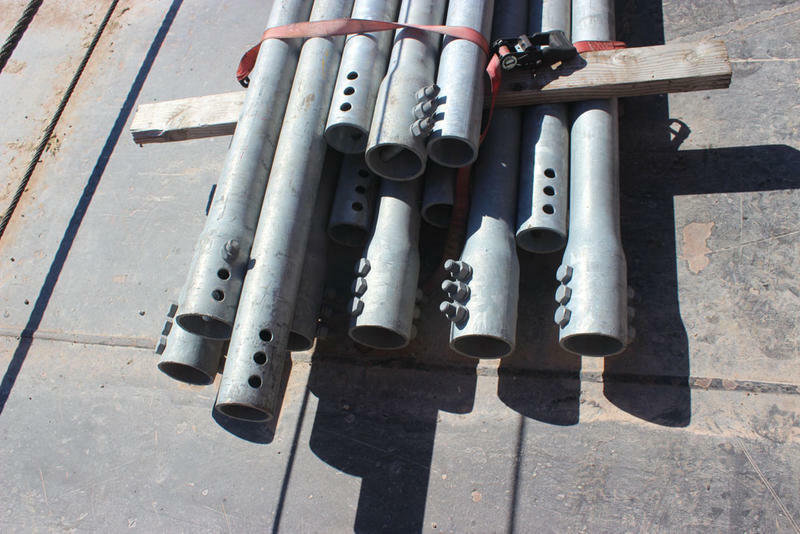 The maximum span or length of pipe unsupported shall not exceed seventy-five (75) feet. 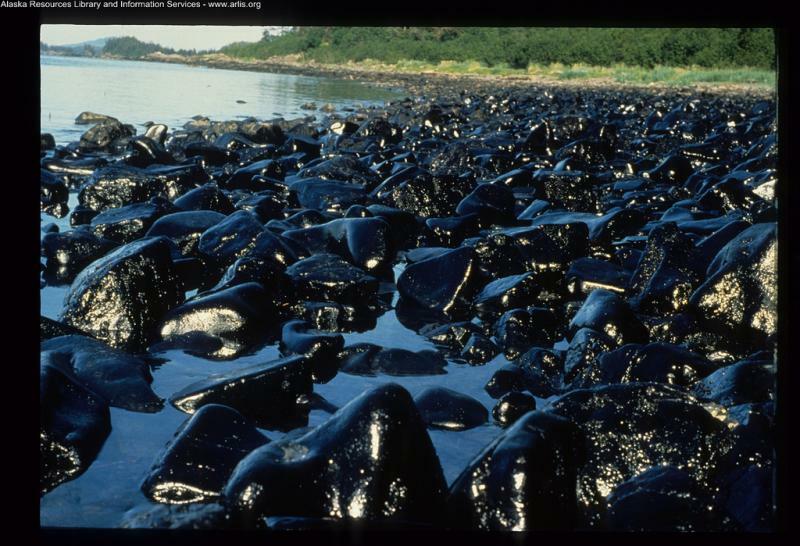 For a state that has suffered through the biggest inland oil spill in North America from an Enbridge pipeline, environmental groups and others have raised concerns about the condition of Enbridge's pipeline running through the Great Lakes. 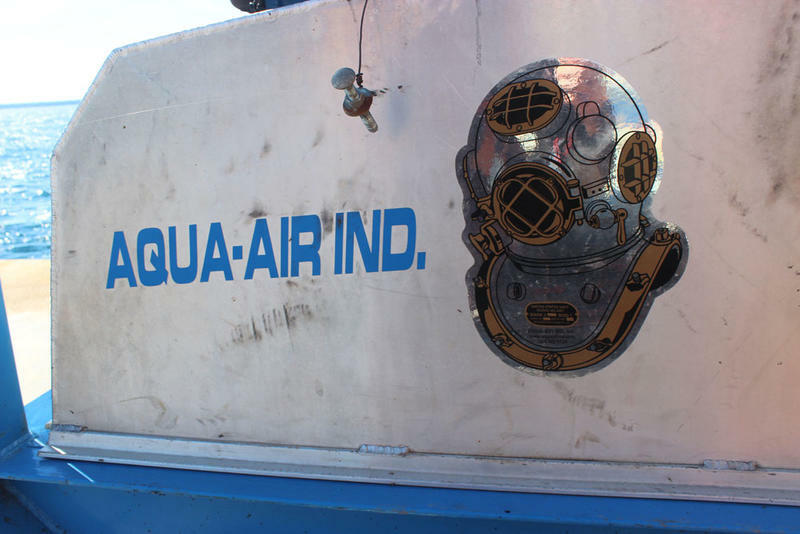 This past spring, state Attorney General Bill Schuette, and MDEQ chief Dan Wyant requested specific information from the company under the terms of the state's easement agreement. They’ve been doing this work, they wrote, since 2002, and they planned to install up to 42 additional anchors this summer. 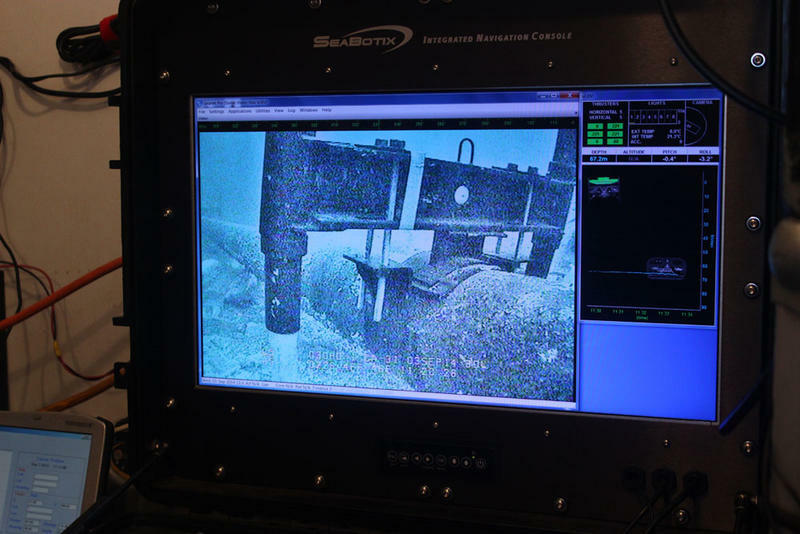 How do they do this with sections of pipeline that are more than 200 feet underwater? 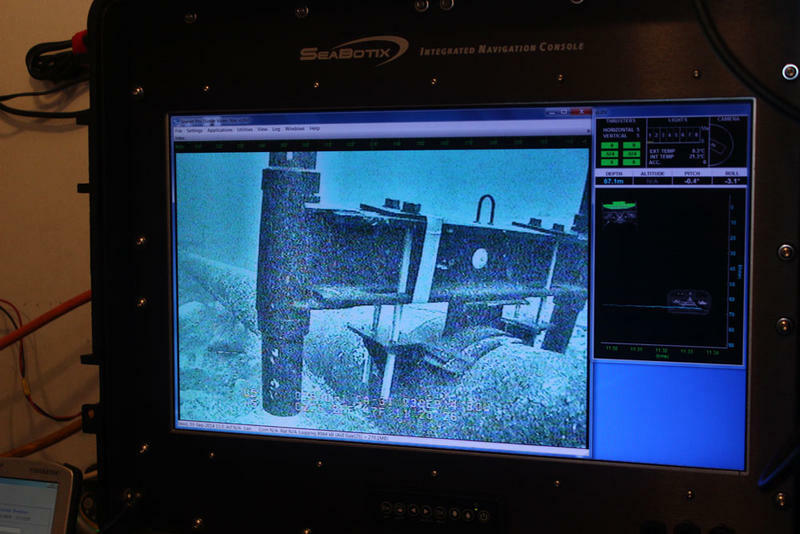 Divers in the Straits of Mackinac have to battle currents at the bottom as if they were in a river. 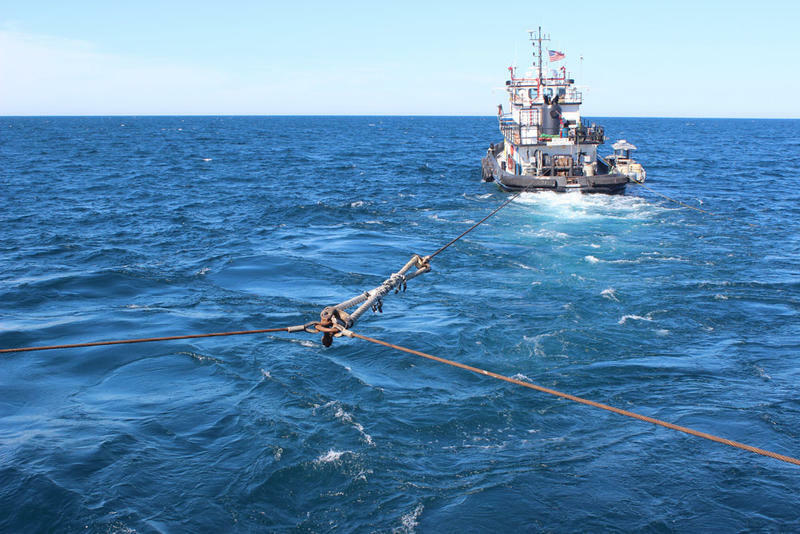 And these currents are what make keeping the unsupported pipeline span lengths at 75 feet or less so challenging. Some sections of the pipeline are supported by the lake bottom, but currents can wash away parts of the lake bed. Tom Prew is a region engineer for Enbridge. 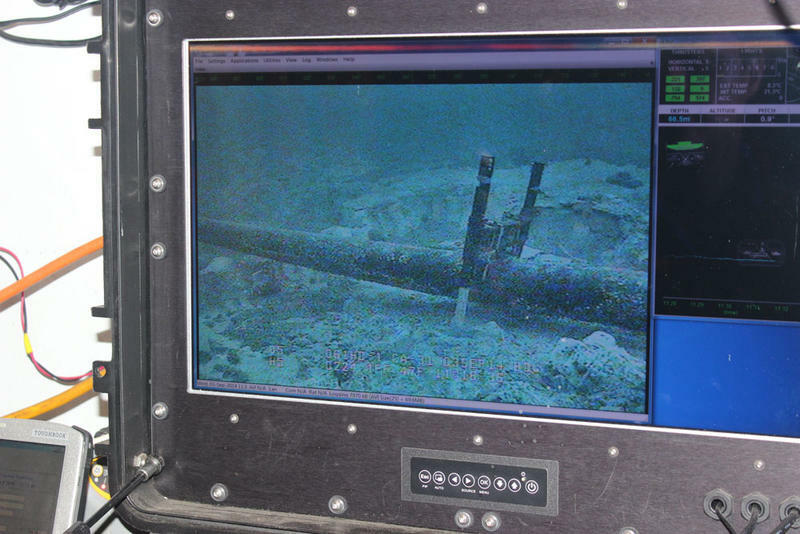 He says the company has been monitoring the outside of the pipeline using an underwater “remotely operated vehicle” every two years. 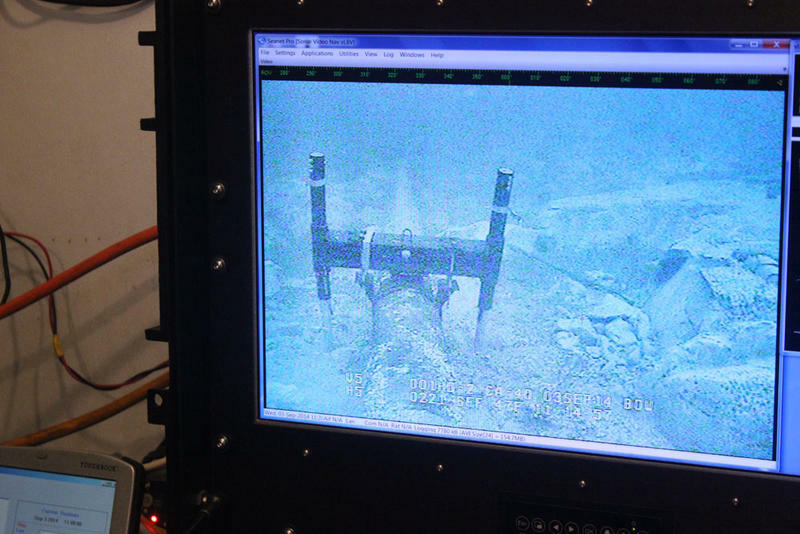 This ROV can find where the washouts have occurred. 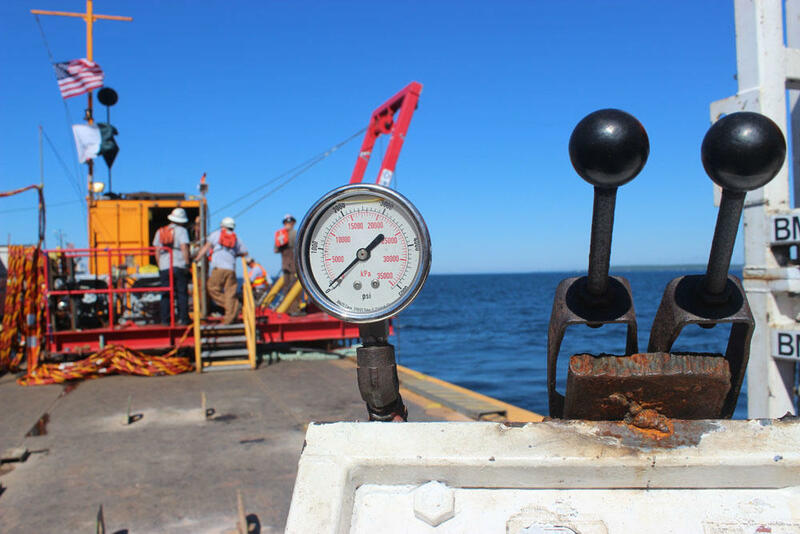 "... we'll replace that lost soil with a mechanical support, so that the pipe is safely fastened to the bottom of the lake." 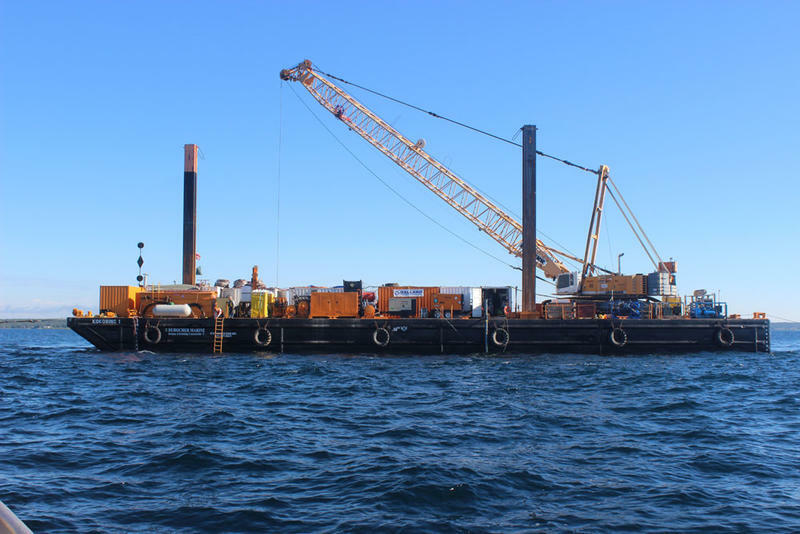 “And we come back, and we’ll replace that lost soil with a mechanical support, so that the pipe is safely fastened to the bottom of the lake.” said Prew. Prew says once they’re done with this summer’s work, the pipeline will meet the easement agreement. Prew says the spans they’ll have in place now are well within what they consider to be safe for this pipeline. The company says this pipeline would be safe with spans up to 140 feet. It's not precise, but you get the idea. 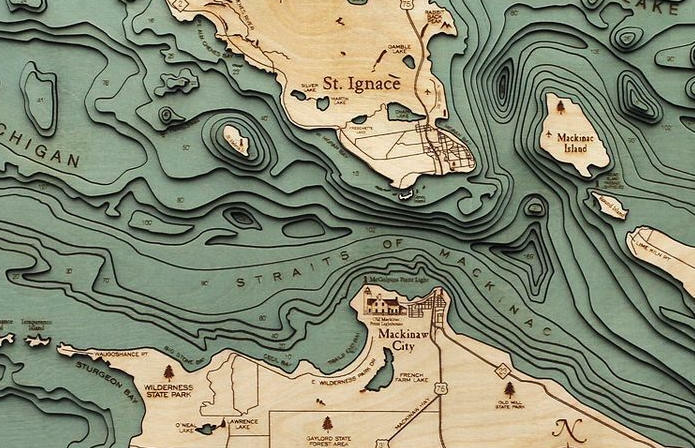 The bottom of the Straits of Mackinac is not flat. 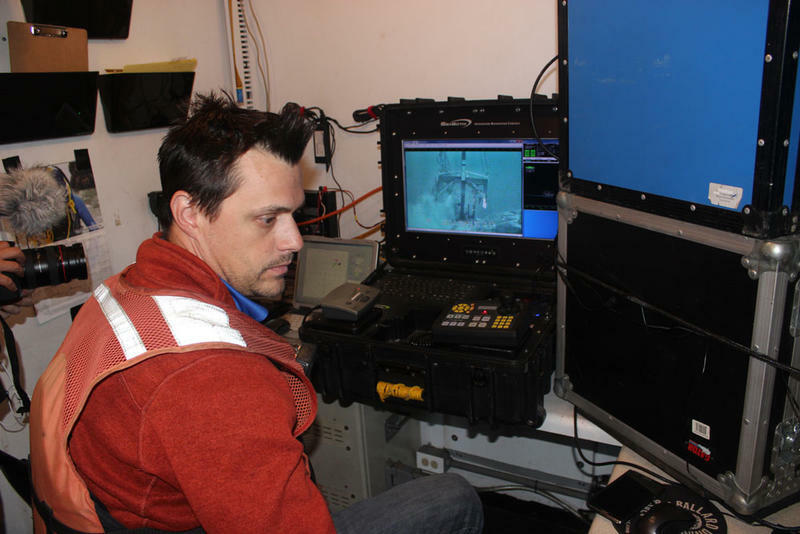 The pipeline suspends over a 250-300 foot-deep, quarter-mile-wide, underwater canyon with steep walls. The tension on that section of the line is likely to be severe—but neither Enbridge nor the government will release any information about how that segment of the pipeline is supported. Tom Prew says he wished the NWF had contacted him before writing this. He says the pipeline follows the uneven contour of the lake bed, and is not suspended over a quarter-mile wide deep canyon. He says the lines are mostly two or three feet off the bottom, and that at most, the line is suspended eight to ten feet above the bottom. Beth Wallace, one of the report’s preparers, said they did try to reach out to Enbridge prior to publishing, but she said the company denied their request for more information citing national security reasons. Wallace and other pipeline watchdog groups say they hope Enbridge becomes more transparent about the condition of Line 5 running through the Straits – a line the company says is in excellent condition. This is a story we’re continuing to look at for our M I Curious project. Watch for updates in the coming weeks. Steve Hamilton talks about what we've learned about cleaning up tar sands oil and the questions that remain. It's been four years since the Enbridge pipeline Line 6B broke, creating the largest inland oil spill in U.S. history. More than a million gallons of tar sands oil have been cleaned up from Talmadge Creek and the Kalamazoo River. This summer, crews are dredging areas of Morrow Lake. Steve Hamilton is a professor of ecosystem ecology at the Kellogg Biological Station at Michigan State University. He’s served as an independent scientific advisor to the Environmental Protection Agency throughout the cleanup. I talked with him for today's Environment Report. A few years ago, right in the heart of the cleanup, an EPA official said the agency was "writing the book" on how to remove tar sands oil from the bottom of a river. Hamilton agrees: "First, before it even got to the bottom, we learned that in the first year, it stuck to surfaces of plants and debris that made a tarry mess that largely had to be manually removed." 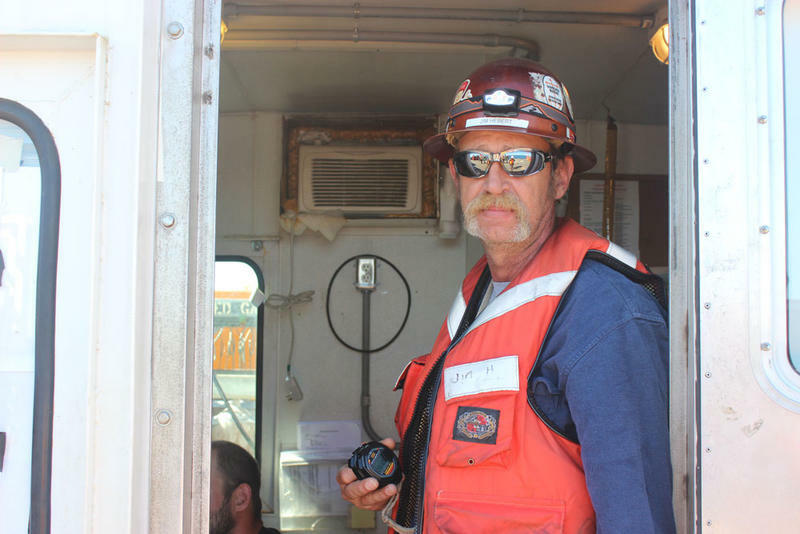 He says it was the removal of the submerged oil that made the cleanup last as long as it has. "It is so incredibly difficult to remove submerged oil from a complex river, extending over nearly 40 miles." OXFORD, Mich. (AP) - A group that opposes expanding an underground oil pipeline in Michigan says two of its members are in custody after locking themselves to a truck belonging to a company involved with the project. 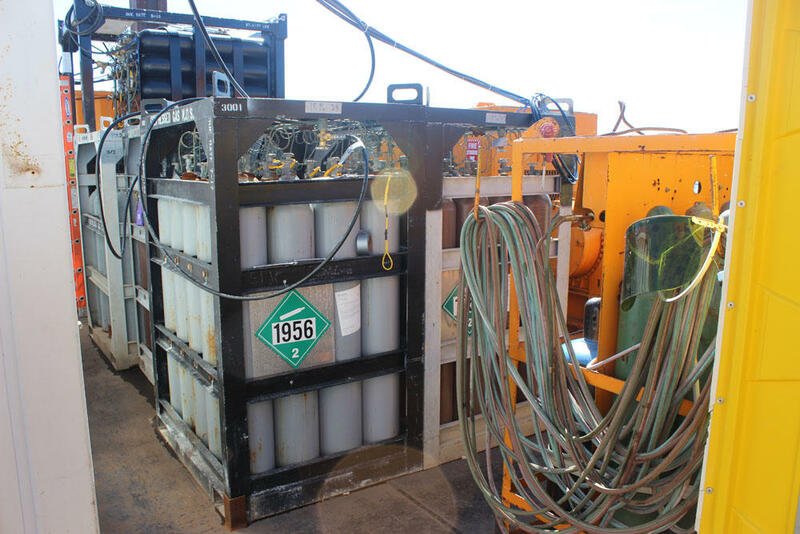 The Michigan Coalition Against Tar Sands says the men used bicycle U-locks on Monday to attach themselves by the neck to a truck at a Precision Pipeline storage yard in the Oakland County village of Oxford. Spokesman Jake McGraw says firefighters cut the men loose after about 2 1/2 hours. He says sheriff's deputies were taking the protesters to jail. Precision Pipeline is the primary contractor for expansion of the line owned by the Canadian company Enbridge Inc.
A section of the line ruptured in 2010, spilling more than 800,000 gallons of oil into the Kalamazoo River. Michigan Attorney General Bill Schuette and the state Department of Environmental Quality have sent a warning letter to Enbridge Energy. It says the company has to do a better job of securing an oil pipeline that runs through the Straits of Mackinac. “We just want to make sure that this pipeline’s going to be safe," said Dan Wyant, director of the DEQ. He says a leak in the pipeline would have implications throughout the Great Lakes. 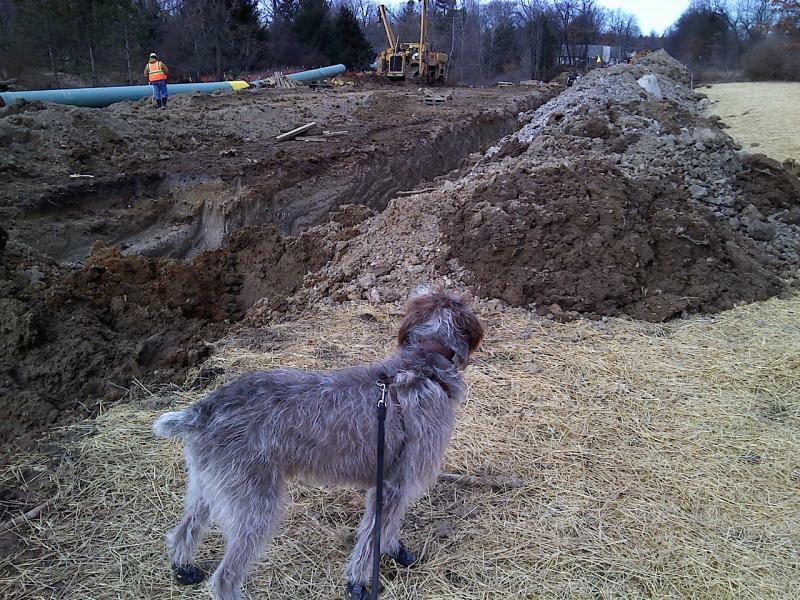 “A lot of concern about this pipeline. Sixty years it’s been safe, but we’re in a position, Attorney General Schuette, I as the chief environmental officer of this state, to ensure we don’t have a problem on this pipeline,” he said. 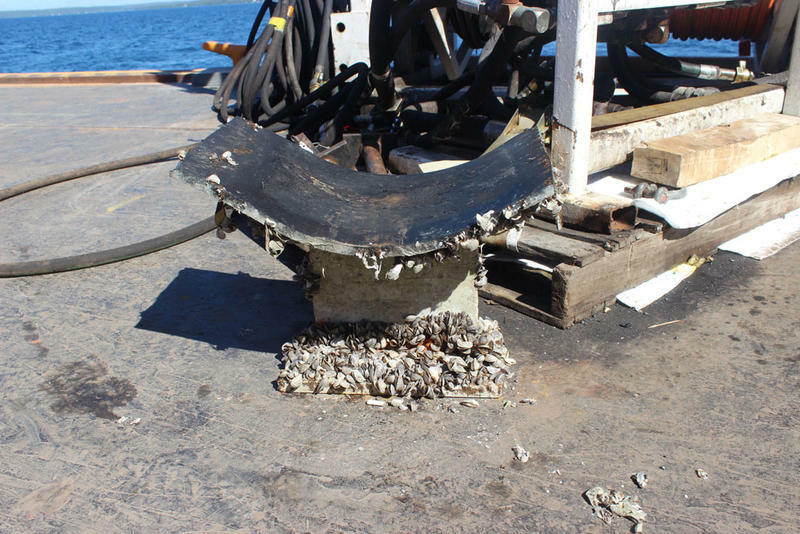 Enbridge quickly responded it would add more anchors to its pipeline. Four years ago, a break in an Enbridge pipe dumped about a million of gallons of oil into the Kalamazoo River. 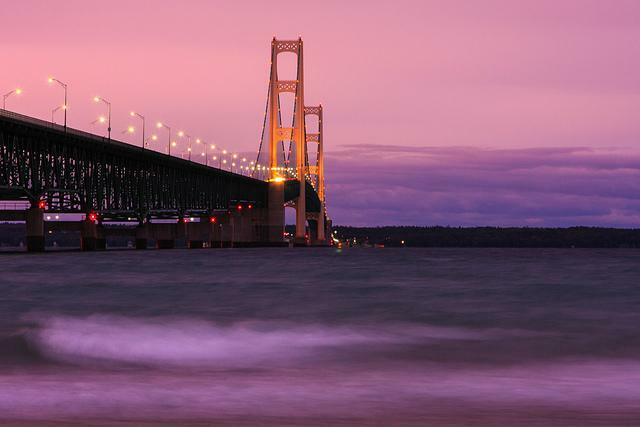 A proposed natural gas pipeline could run through Michigan on its way to the Canadian border. 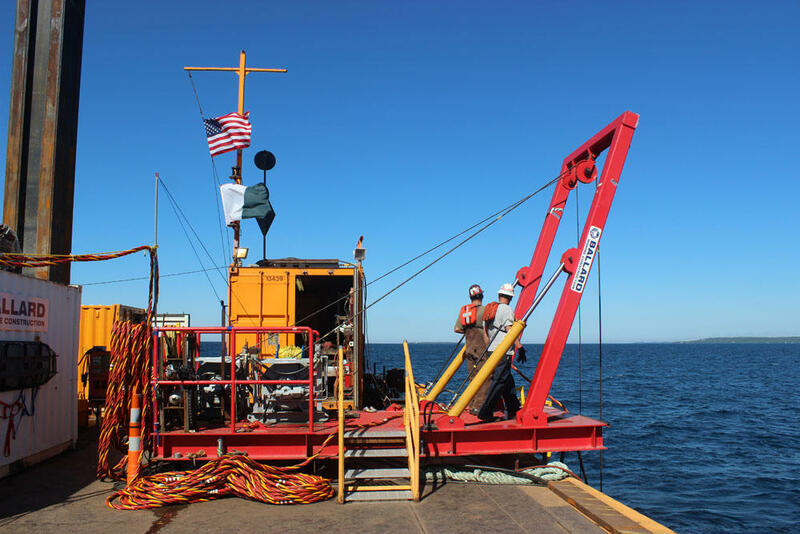 ET Rover, a subsidiary of Energy Transfer Partners, is planning a pipeline that would run through about 180 miles of Michigan. Some of it would track the same route as the controversial Enbridge 6-B pipeline that was recently replaced. The company has sent out about 15,000 letters to landowners on and around the proposed line, asking for permission to do land surveys. ET Rover will then submit a plan to the federal government for review. Vicki Granado is the company's spokesperson. "It’s important to Energy Transfer that we reach out and communicate and meet people and we talk to them," said Granadao. "It’s also important that as we do work in these communities, that we are very respectful of people’s property and of all of the environmental concerns." Jeff Insko is a landowner in Oakland County whose backyard was torn up for the Line 6B project. "The prospect of having to go through it all over again is utterly demoralizing," said Insko. "People are disheartened and some of them are angry; some of them are stubborn and ready to fight." ET Rover will hold an open house tonight in Fenton to update residents on the proposal. That's what some in Michigan are undoubtedly thinking as they learn of a proposed natural gas pipeline that could run through Michigan on its way to Ontario, Canada. 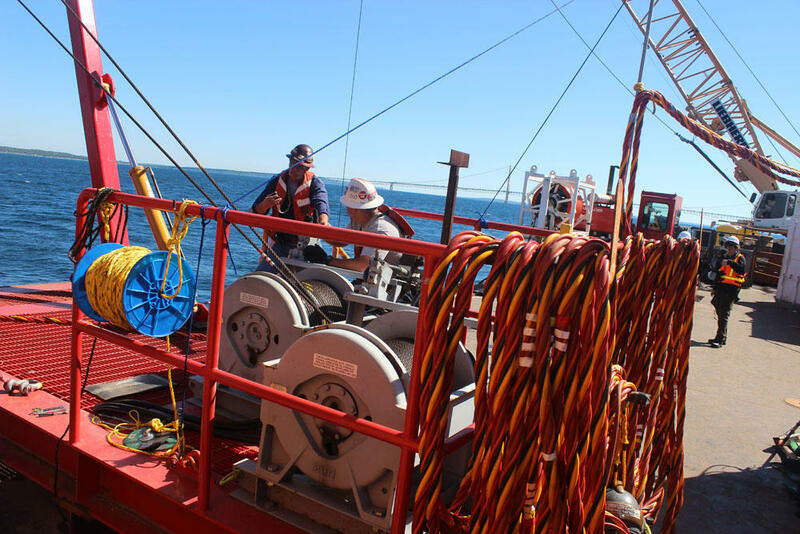 The proposed Rover Pipeline would carry natural gas through about 180 miles of Michigan. Some of it would track the very same route as the controversial Enbridge 6B oil pipeline that was recently replaced. Keith Metheny is a reporter with the Detroit Free Press. Metheny said the pipes will take natural gas from areas in Pennsylvania, West Virginia, and Ohio and ship it westward into Michigan, through the southeast corner, spanning through six counties, and ending up in a hub in Ontario for distribution. The pipeline might follow a portion of the 6B route, around Oakland, Macomb, and St. Clair counties and possibly others. “It’s going to be the very same people, the very same route, the people who saw their backyards torn up for a year, the people who occasionally had their roads inaccessible,” Metheny said. Metheny said this pipeline would be large, 42 inches in diameter that will transfer more than 3 billion cubic feet of gas per day. “In the highest gas demand day ever for Consumers Energy, which was in January 2013, they pushed out less natural gas across the entire state of Michigan than the amount that would pass through this pipeline every day,” Metheny said. He added that the Federal Energy Regulatory Commission will determine if the pipes go down, but a decision may not be made until 2015. Energy Transfer will hold a series of public meetings along the path of the proposed Rover Pipeline. There will be a meeting this evening in Chelsea at 5:30 pm to 7:30 pm at the Comfort Inn Village Conference Center on Commerce Park Drive in Chelsea. And there's a meeting tonight in Richmond at the Lois Wagner Memorial Library, again, from 5:30 pm-7:30 pm.